With Saturday’s Opening Ceremony formally kicking off the 2016 420 and 470 Junior European Championship, today racing got underway with a packed 3 race programme for each fleet. The 2016 420/470 GROUPAMA Junior European Championships kicked off on Saturday 30 July with a parade of teams from 23 nations from the venue through to the heart of Balatonfured at Vitorlás Square. Sunday was all focus on racing, but the breeze had other plans. Light air slipped in over the two race courses on Lake Balaton, teasing the 406 sailors who were keen to start their first day of racing. In a surprise turn of weather, the postponements ashore and afloat soon converted to a blistering three race opening day. A testing day, as teams explored the nuances of the race track on the renowned turquoise waters of Hungary's famous Lake Balaton. It's difficult to do well in every race, with the shifty conditions reflected in up and down scorecards for many. 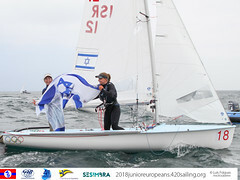 A stellar line up of teams is in contention for the 2016 470 Men Junior European title, with Giacomo Ferrari/Giulio Calabro (ITA) and Yoav Rooz/Maor Abu (ISR) staking an early win in the opening race of each of the yellow and blue fleets. Ferrari/Calabro followed up with two more race wins, making it three in a row. With the race discard coming into play after race 3, Germany’s Malte Winkel/Matti Cipra stepped up to match the Italians scorecard, each now counting 2 points. A strong understanding of the race track rewarded the German pair with a 2,1,1 sheet. “The conditions were not what we expected,” commented Cipra. “Like everyone, we expected light winds and flat water. But actually today we had up to 18 knots at some points, and of course also less. It was really shifty, really gusty – but three good races. 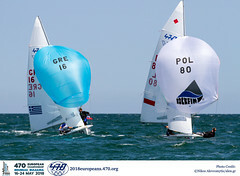 Home star and Hungarian 470 National Champions, Balazs Gyapjas/Zsombor Gyapjas accelerated their performance, converting results of 9, 13 to a second place finish by race three, to close their opening day in 10th overall. “We have been really excited about hosting the Junior Europeans, it is fantastic for us,” reflected Gyapjas. 2015 470 Junior World Champions Benedetta Di Salle/Alessandra Dubbini (ITA) set down the marker in the fleet, knocking out back to back race wins. “I don’t think I have done this before,” smiled Di Salle on her three wins. “The Championship starts good, but it is very long, so we have just to do our best. We have just been training here for three days and never raced here before. The Italians have a point to prove, particularly up against the Spanish pair and reigning 470 Junior World Champions Silvia Mas/Paula Barcelo, who claimed silver at last year’s Junior Europeans, with the Italians picking up 4th, just 1 point shy of the podium. “We would like to win, but it is not easy,” grinned Di Salle. Rating as one of their strongest every Championship opening days, Turkey’s Beste Kaynacki/Simay Aslan are in second, with Israel’s Noya Bar-Am/Stav Brokman in third. Set for the challenge of stiff competition in the 470 women fleet are many young teams fresh to 470 class racing, including established talent from the 420 Class, such as 2014 420 World Champion Carlotta Omari with crew Matilda Distefano, 2015 420 World Champions Marta Garrido/ María Jesus Dávila (ESP), and Australia’s Nia Jerwood and Monique de Vries. Jerwood walked off with the silver medal at the 2015 ISAF Youth Worlds, and 4th at the 2015 420 Worlds. Setting the opening race pace in the 420 Open fleet, for teams aged under 19 years old, were Telis Athanasopoulos Yogo/Dimitris Tassios (GRE), scoring a 1,2,1 and gaining themselves a helpful points advantage. Switzerland’s Maxime Bachelin/Arno De Planta sit 9 points behind, 1 point ahead of Spanish brothers Carlos Balaguer/Ignacio Balaguer. The pool of talent in the 420 Class runs deep, with an overwhelming number of national champions in the mix. The 83 boat fleet is seeded into two fleets, for a 6 race qualifying series, before being split into gold and silver for final series racing. 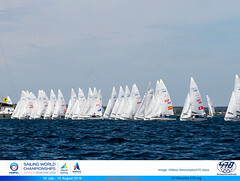 “The biggest challenge was a lot of changes in the wind pressure upwind,” added Athanasopoulos. Looking further down the leaderboard and roller coaster results for some. This is usual in the 420 class, and today's lag-behinds may be tomorrow's leaders, helped by the race discard kicking in after race 5. Thirty-eight teams are in the running for the U17 Junior European Champion crown, in a 12 race charge for glory. Consistency from the leading four teams who each claimed strong single-figure results. The 420 fleets will each contest 3 races, with a scheduled warning signal of 0955 hours. Two races for the 470 fleets, with the 470 Women racing first, followed by 470 Men yellow, then 470 Men blue, with a scheduled warning signal of 0955 hours. Daily highlights videos are available on the Championship gallery and 420 YouTube.